Unicorns & Zombies is an exciting, magically mystical, and slightly addictive card game featuring battles between two unlikely fantasy foes. LOS ANGELES, CA, July 27, 2018 /24-7PressRelease/ -- Unicorns and Zombies is the highly anticipated turn-based card game that is making its way to the masses using the crowdfunding website: Kickstarter. The game is a combination of humor, beautifully creative graphic art, multi layered strategic options, and a cast of crazy characters. On one side, a gruesome army of undead zombies strive to destroy everything in an already war-torn dystopia. On the other side, a magical squad of colorful unicorns with deadly horns and a fatally enchanting glare prepare to go to battle. Players choose a side and fight for supremacy using a combination of character specific skills, gear and battle actions. The Kickstarter campaign has already raised a large portion of the funds needed for production, and the game's developers hope they will soon cross the funding finish line so they can deliver the new games to their fans. "We hope to meet our funding goal of 12K, and to build a community around the game," said one of the creators. "We'd like to cultivate a collective of people passionate about the war between Unicorns and Zombies!" The game is high speed, and intense. Each battle is designed to last approximately 15 – 20 action packed minutes. Leading a team to victory in this fast-paced action game can be wildly exhilarating, or crushingly frustrating. It's not unusual for players to flip the colorful board game over in a rage, quitting the game entirely. After all, the basis of the game is to lose friends or gain allies. With the myriad of characters and countless potential strategies, the game is always challenging and different. Much like the popular game of poker, Unicorns and Zombies takes a "few minutes to learn, and a lifetime to master." The two self proclaimed "intelligent geeks" who developed the game have spent hundreds of hours fine tuning every aspect of the imaginative battlefield. Now, ready to go into production, they hope the public and the crowdfunding website Kickstarter page will get the game off the ground and into mass production. Unicorns and Zombies have plenty of fans looking forward the official game day, and the effort is well on its way to success, having reached approximately 75 percent of the campaign goal. But, the project is an 'all or nothing' campaign, meaning the team behind Unicorns and Zombies must meet their $12,000 goal or face cancellation. The project is scheduled to complete on Wednesday August 15th. 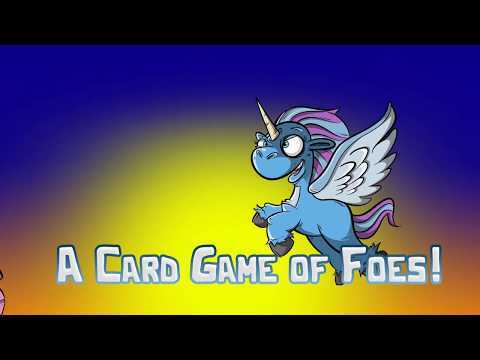 Until then, the team is encouraging fun-loving people everywhere, with an interest in turn-based card games, to visit the website and learn about helping fund Unicorns and Zombies. Backers who would like to support Unicorns and Zombies can earn copies of the game and exclusive cards available only through donating at the Unicorns and Zombies Kickstarter page. So, players ready to direct an enchanting magical squad of unicorns, or lead a ghastly crew of zombies into battle will want to put in a contribution at Kickstarter today. Unicorns & Zombies is a turn-based card game for 2-4 players which pits — unicorns against zombies.